Dear readers, Mexico Real Cafe has the pleasure to share with you our post dedicated to Diego Rivera who was one of the most influencial political activists and painters of the 20th century in Mexico. Diego Rivera was born in 1886 in Guanajuato, one of the most beautiful and historical cities of Mexico. To those who do not know where Guanajuato is located, let us tell you that it is located in the heart of the country. Guanajuato is the place where Mexico’s independence (the end of the Spanish colonialization over Mexico) was planned and executed by the Mestizo and criollo social classes who wanted to gain power. They led the indigenous people to fight for independence and freedom from oppression. Guanajuato was also a very important place for its natural wealth. It was rich in gold and silver mines that were exploited by the Spaniards for many centuries. Today, UNESCO has named Guanajuato a World Heritage Site because of its unique colonial architecture that flourished after the Spanish conquest of Mexico. Diego Rivera was born in this historical place, son of a Mestizo woman (part Indian and part European) and a criollo man (of European descent born in Mexico). Rivera’s exceptional artistic talent was obvious from an early age, he painted his first murals on his home’s walls when he was around 5 or 6 years old. Because of his talent Diego Rivera got a sponsorship from the Mexican government to study in Europe, he studied in France and Spain. From the latter he was influenced by Realism and impressionism; and cubism from France. In Paris he used to live in Quartier de Montparnasse where he used to gather with colleagues in cafes to discuss for many hours about art and the cubism style while having a cup of coffee. Though Rivera’s painting style shows signs of cubism (the use of geometric forms in artwork), realism and impressionism, Rivera’s main contribution was particularly on muralism. Diego’s murals revived the ancient Mayan mural tradition, and gave a visual voice to indigenous Mexican labourers, miners, farmers, and peasants seeking social equality after centuries of oppression. As Rivera was a political activist and founder of the communist party in Mexico, Diego’s paintings are also about political events. Through his artwork Rivera brought to the front his ideological views, for example in his depictions of the Mexican Revolution. Diego Rivera influenced the world of art through muralism, he was the founder of this style, his largest contribution is the fact that muralism took art out of the gallery and placed it in public areas so that more people could enjoy and appreciate its beauty. Rivera’s work inspired programs like U.S. President Roosevelt’s Federal Art Project, which employed artists to paint scenes of everyday life on the sides of buildings. In the 1930s and 40s, Diego Rivera painted several murals in the United States. Rivera’s paintings also combine elements of Mexican heritage such as in his painting of flower sellers with calla lilies (1941), The Day of the Dead and The Maize Festival (1923- 1924). Today Rivera’s paintings are indeed highly appreciated in the United States. In May 2018 one of his paintings was sold in New York for a record $9.76m (£7.17m), the highest price paid for a Latin American artwork at auction. About Rivera’s personality, it is well known that Rivera had a strong and controversial personality. It was due to his personality that he grew distant from his painting colleagues in Paris and returned to Mexico. But the most eye-catching aspect of his personal life, was his marriage and stormy relationship with Frida Kahlo who is one of the most influential Mexican painters. This relationship has remained a subject of great fascination and speculation. They both are known as the most influential artists of the 20th Century and icons of Mexican culture. For instance Frida Kahlo was the first Latin American woman to have a painting in the Louvre. Her work caused a storm in Paris in 1939 (at an exhibition entitled Méxique). Kahlo was 15 and Diego Rivera 37 years old when they first met. Kahlo and Diego Rivera painted each other for 25 years. Their paintings give an insight into their complex relationship: Diego’s and Kahlo’s affairs, Kahlo’s abortions; their divorce in 1939 and remarriage in 1940. Their relationship was full of passion, adoration and resentments. Everything you want to know about their relationship is portrayed in their artwork. What it is also true is Rivera’s love for Kahlo. After Kahlo’s death at the age of 47 in 1954 as a consequence of permanent damage due to the car accident she suffered when she was teenager, the widower Diego Rivera claimed publicly his eternal love for Kahlo in a painting. In this painting Diego depicts Kahlo as an esoteric icon full of primal energies: fire and earth. The painting also portrays Kahlo’s interior and exterior forces which are represented by trees and a heart shape. At the bottom of this painting Rivera writes with small letters: For the girl of my eyes. Today both of them have passed away but this painting dedicated to Frida Kahlo is proof of Diego Rivera’s eternal love for Frida. Diego Rivera and Frida Kahlo are two the most influential Mexican painters and lovers of mexican coffee whose artwork is known internationally. Their paintings have been exhibited in museums and art galleries in developed countries like France (Paris), Spain (Madrid) and The USA (San Francisco, New York). Mexico Real Cafe invites you to learn more about Rivera’s wife Frida Kahlo, who is an icon of Mexican Culture and has had an extraordinary artistic contribution. In our post dedicated to Kahlo you can read about her life, personality and paintings. 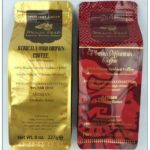 Mexico Real Cafe is proud to share with you the best of Mexico like its Mexican Arabica Coffee single Origin Pluma Mountain Oaxaca and Maya Chiapas Coffee, the Mexican Art and Influential Artists who represent Mexican culture, have shaped Mexico’s history and have influenced world history. Visit Mexico Real’s Cafe blog where you can read more interesting posts like this. We hope you have enjoyed this post.